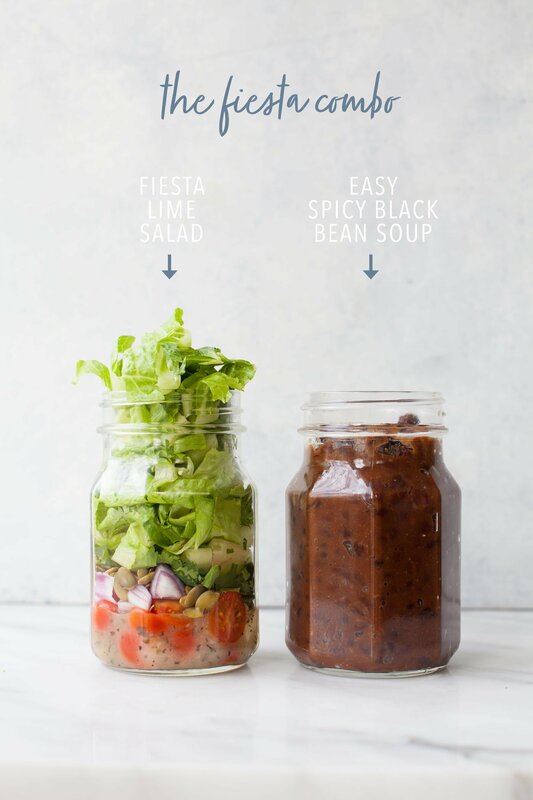 Let me introduce you to my all-time favorite office lunch—the soup and salad Mason jar lunch combo. 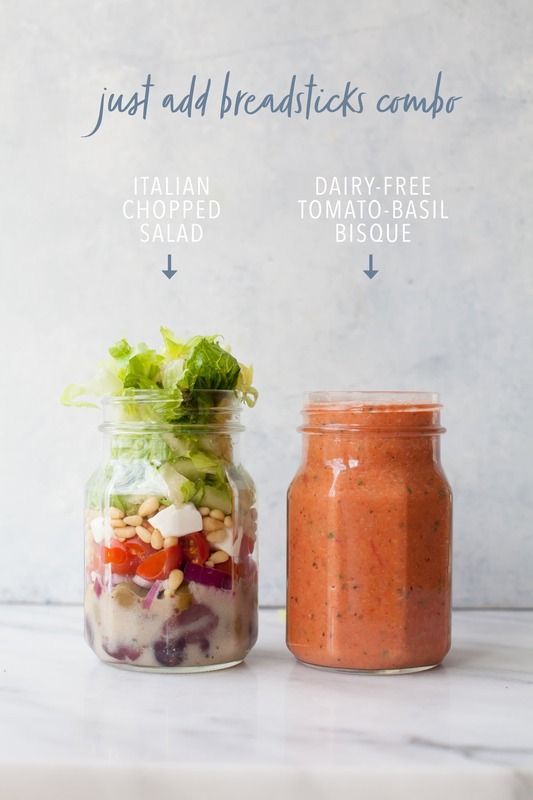 When I was working in an office, I brought this exact pairing—one Mason jar with soup and one Mason jar with salad—for lunch so often that it kinda became a thing with my coworkers. I started a bit of an office wide revolution. Why is this combo (and these containers) so trend-worthy? Lots of reasons! This is the perfect amount of food to make for a filling, nutritious lunch. Mason jars are food-safe, sturdy, and incredibly affordably (these hexagon beauties I found on clearance at my local hardware store for $1.76 for a four-pack). 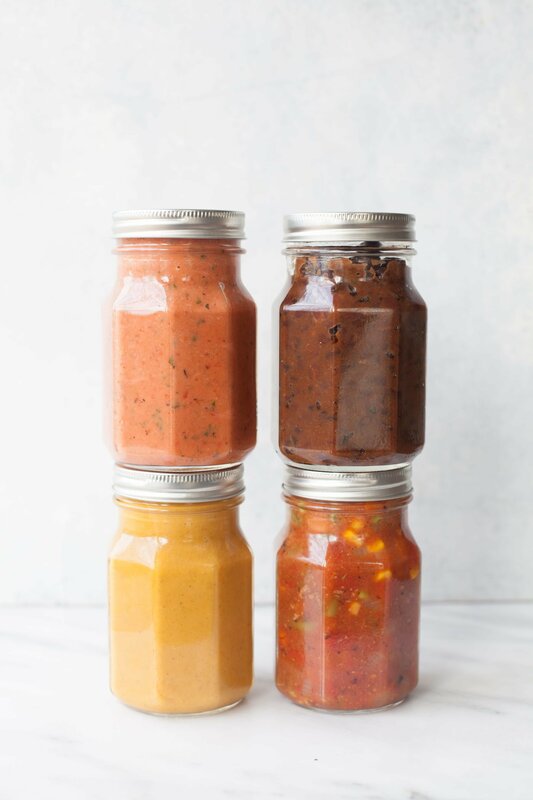 Mason jars are the perfect vehicle for heating up soup in the break room microwave (just remove the metal lid and cover loosely with a paper towel, stir, and eat!). And, best of all in my mind, these lunches can all be made ahead of time. Like, we’re talking making your lunches on Sunday for the whoooolllleee work week, and still having fresh, crisp salads and flavorful, healthy soup on Friday at noon. 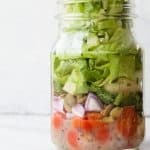 Now, every time I post a Mason jar salad on social media, I inevitably get a whole slew of DMs from people saying, “But do they really stay fresh? !” I promise you, they do. 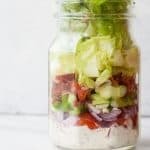 If you stack your salads-in-a-jar in the correct order and keep them upright, you’ll have fresh, crisp salads up to a week later. 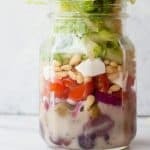 I have a more in-depth post on Mason jar salads that is worth a read (and a viewing—there is a video with tips) if you are tackling them for the first time. Now, of course, you can mix and match any soup and salad recipes you like, but I’m particularly fond of the recipes and combos below. They are simple. They are easy to pull together on the weekend. They are flavorful. And they are nutritious. Alright, let me show you my favorite combos! 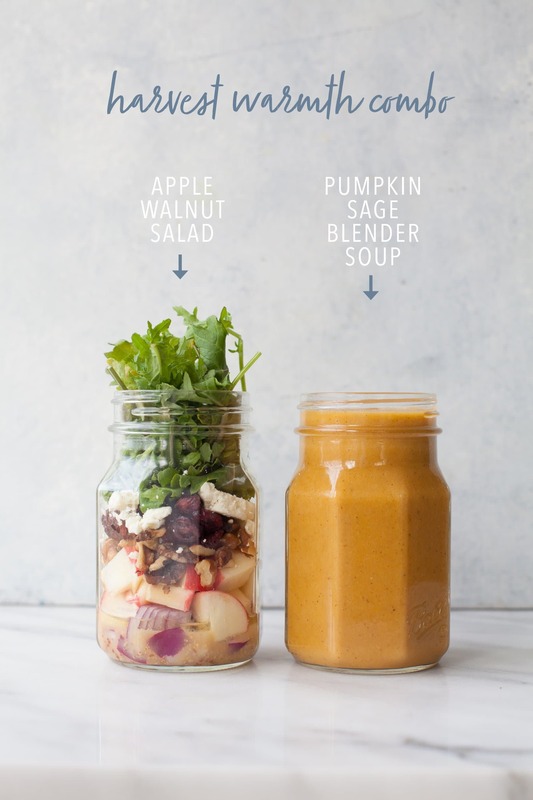 This combo of Blender Pumpkin Sage Soup and Apple Walnut Salad might be my favorite of all the combos for one simple reason: it’s so darn easy to pull together! 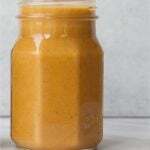 The soup is literally just open some cans in a blender, add some spices, blend, and then pour it into a jar. And the salad is such a glorious combo of flavors, textures, and colors! A note on the apple in the jar: I instruct you to treat the apple with a lemon juice wash to prevent browning, but even that won’t keep the apple crisp and un-brown for very long. If you add the apple to the jar, I recommend eating within 24-36 hours. If you want to have it last longer, add the apple right before serving. This salad features a beautiful mix of colors, textures, and flavors! I like it with baby kale, but if you’re kale-adverse, baby spinach is equally delicious. In a small bowl, mix together the lemon and water. Add in the diced apple and toss to cover the apple well. Drain the apple discarding the lemon water, and set apple aside. 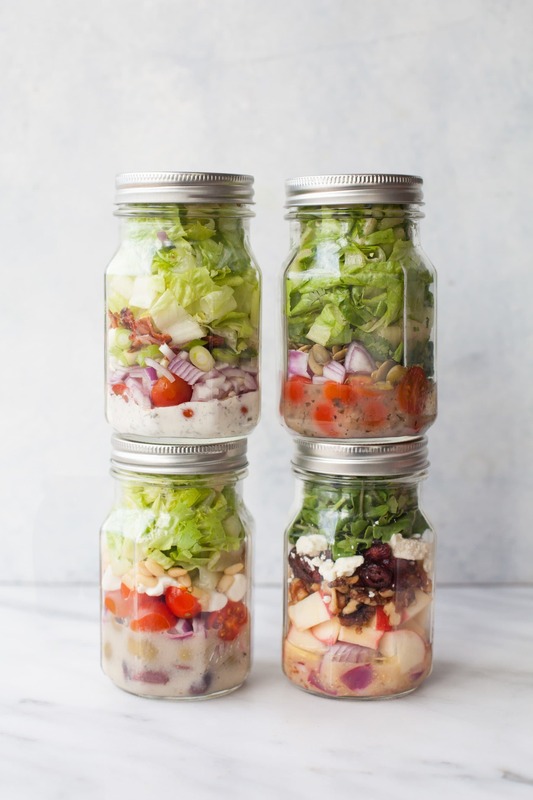 Divide the dressing evenly between two wide-mouth pint-size Mason jars. Add in half the apple into each jar, and then divide all remaining ingredients between the two jars—making sure to follow the order listed in order to keep the spinach or kale crisp. Stuff in as much greens as you can, screw on lid, and stash in fridge for up five days. This pumpkin soup is silky, rich, and packed full of complex flavor—you’d never know it took five minutes to make in the blender! In the pitcher of a blender, combine all ingredients. Blend on high until very smooth. Pour into pint-size Mason jars. Seal lids and stash in fridge for up to a week. 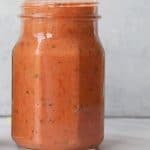 To reheat in microwave: remove lid from jar, cover jar loosely with a paper towel, and microwave on high for 2-3 minutes—stirring every minute—until hot. To reheat on stovetop: pour soup into a small saucepan. Head over medium heat, stirring occasionally, until hot throughout—about five minutes. If your coconut milk is chilled, it might have separated into solids and liquids. That’s okay! Just put everything in the blender and blend away. Your final soup might look like it’s curdled—but that’s just the tiny bits of coconut cream. When you heat the soup, they’ll melt and make for a smooth and creamy soup. I love this combo because it’s a cozy and warm meal like I always crave in winter, but it’s packed full of bright summery flavor. It’s like the best of both worlds! Tomatoes can be pretty lackluster in the wintertime, but I have better luck buying cherry tomatoes throughout the year than the big tomatoes. Something about those little beauties seems to keep them from succumbing to the January pink, mealy tomato disease that infects their bigger cousins. Think of this bright and citrusy salad as like taco salad light! I like to add a whole bunch of avocado just before serving. Cilantro hater? No worries, just leave it out. Divide the ingredients evenly between two wide-mouth pint-size Mason jars. Make sure to follow the order listed in order to keep the lettuce crisp. Stuff in as much lettuce as you can, screw on lid, and stash in fridge for up to a week. You can add fresh chopped avocado and crumbled cotija cheese right before serving. Yum! We take a shortcut here to make this soup quick and easy to make—canned seasoned black beans. Check the bean or International foods section of your grocery store, most will have them. Heat the oil in a Dutch oven or soup pot over medium-high heat. Add in the onion and garlic and cook until just fragrant and tender, about five minutes. Add in the black beans, chicken broth, cumin, chili powder, cayenne, salt, and black pepper. Bring to a boil, reduce heat to low, and simmer for 15 minutes, or until the soup is has thickened. Divide into two pint-size Mason jars. Seal lids and stash in fridge for up to a week. Top this with chopped avocado and sour cream right before serving. I like serving it with some tortilla chips for dipping! If you can’t find seasoned black beans, regular canned black beans will work, too. There was a time in college where, every Friday for lunch, some of my very best girlfriends and I would head to a particular chain Italian restaurant and gorge ourselves on soup, salad, and breadsticks. This soup and salad combo reminds me of those wonderful lunches spent laughing with my friends! You just need to add some breadsticks. This tomato soup is also ah-maze-ing with some grilled cheese for dippin’. If you have access to fresh basil, that makes for the best flavor in the soup, but please don’t waste spend your hard-earned money on those anemic clamshell boxes of basil that the grocery store tries to sell for $5 each in the winter. Dried will do just fine. 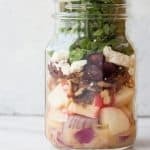 There is so much goodness in the bottom of this salad jar—there isn’t a whole bunch of room left for greens! That’s okay, the jar is still packed with flavor and nutrition. Stuff in as much lettuce and greens as you can, screw on lid, and stash in fridge for up to a week. Depending on the age of your mozzarella, you might get more like 2-3 days out of a jar with cheese in it. To get a full week worth of shelf-life, leave the cheese out of the jar and add it just before serving. This blender soup ends up being the most lovely pink color! A big chunk of the flavor comes from the fire roasted tomatoes, so make sure to grab those instead of just regular diced tomatoes. There is something about this combo of classic Vegetable Beef Soup and a deconstructed Wedge Salad that makes me all kinds of nostalgic. Neither of these recipes are particularly fancy. And you probably wouldn’t serve them to guests, but they are warm, comforting, and über tasty (like the best comfort food always is). The biggest shortcut here? Frozen mixed veggies! They save you tons of chopping and cooking time on the soup—and bonus, they are mega affordable. You can grab a bag of organic frozen mixed veggies for less than $2. Steal. Wedge salads are decidedly not fancy, but they are decidedly delicious! 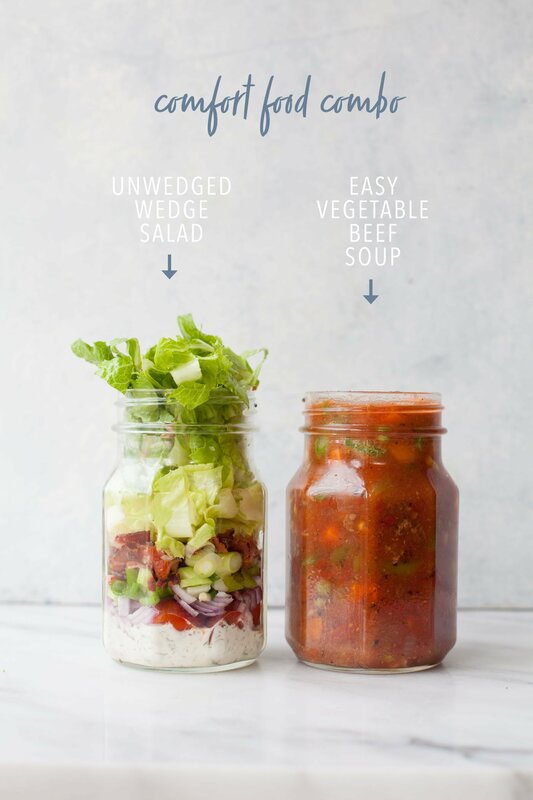 We deconstruct the wedge salad and put it into jar for super easy lunches. 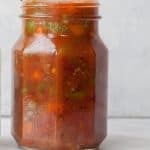 Way better than anything you’d get from a can, this Easy Vegetable Beef Soup comes together in a flash on the stove! Heat a Dutch oven or soup pot over medium-high heat. Add in the ground beef, and cook until browned through. Drain all but about a tablespoon of the fat. Add in the onion, garlic, and celery, and cook until just fragrant and tender, about five minutes. Add in the beef broth, mixed vegetables, diced tomatoes, salt, pepper, bay leaves, and thyme. Bring to a boil, reduce heat to low, and simmer for 10 minutes, or until the soup is warmed through and all vegetables are tender. Remove from heat and discard the bay leaves. Divide into four wide-mouth pint-size Mason jars. Seal lids and stash in fridge for up to a week. So there you have it! 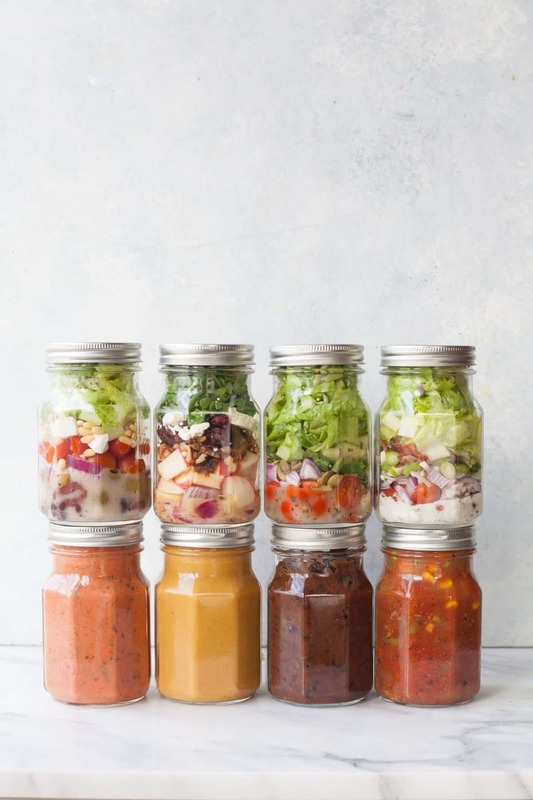 I know variety is the spice of life and all, but I’d be more than content with to spend the rest of my lunches eating a Mason jar soup and a Mason jar salad. Enjoy! Thanks! These look great and I can’t wait to try them. Can I make a suggestion? Being able to print them all at once or pin them all at once would be super helpful. Thanks for all of your great content! Pinning to come back to later! These all look incredible, especially that pumpkin sage soup! Yum! These are so cute & smart!! I’m not sure which one I should do first! Omg that’s such a good idea! I’m going to have to start making soup and salad combos! I love these ideas and your mason jars! I always use glass containers but love those jars. Great idea for my son’s school lunches as well. I am trying this for the first time. I plan on bringing a soup and salad jar to work tomorrow. This may be a silly question, but I will ask it anyway. How do you eat the salad? Is the best way to empty on a plate? Yes! 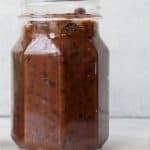 You can try to eat it straight out of the jar, but it is difficult to get everything mixed up without making a huge mess that way. We recommend pouring it into a plate or bowl.